« Let’s Make Games Inc.
Update: Check out the new flyer! We are very happy to announce our third event for 2011: Show Us Your Bits! 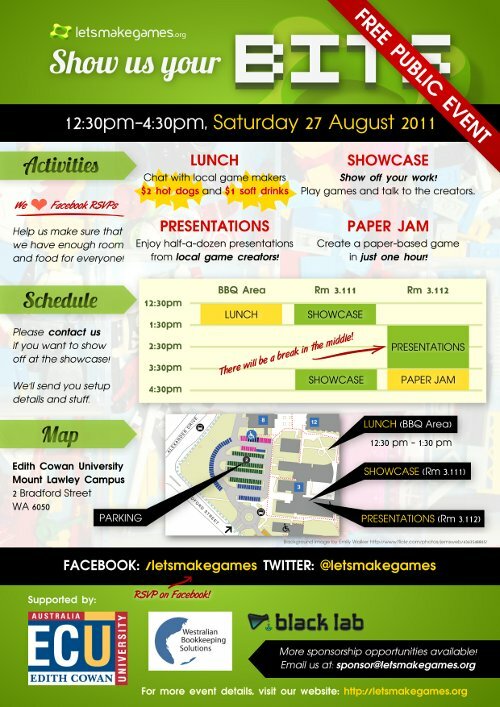 Last run in 2009, Show Us Your Bits is all about showcasing locally-developed games and local game developers. If you make games, we encourage you to come on down and show off your work. If you’re interested in games, this is a great opportunity to meet local game makers, play their creations, learn more about how games are made, and even make your own! RSVP: Comment on this post, contact us, or use the Facebook event page. An RSVP isn’t necessary if you just want to stop by and see what’s happening, but we really appreciate them because they help ensure enough space and food! Showcase (12:30pm-4:30pm): Game developers are encouraged to bring their laptops (and other devices) to show off their games, and everyone is invited to play some games and meet the people who made them. Presentations (1:30pm-3:30pm): There will be six ten-minute presentations from local game creators on topics such as: game engine development, and card game prototyping and design. Paper Jam (3:30pm-4:30pm): Bring a deck of standard playing cards, ten sheets of paper (cardboard preferred), scissors, and pencils (or markers) and make a game in this free hour-long workshop! If you would like to show off your work as part of the showcase, please send us a title, screenshot, and team name (and logo if you have one). We’ll send you more information (such as when to setup etc.). Firstly, we’d like to extend a huge “Thank you!” to our Platinum sponsor, ECU. They have been a fantastically supportive venue sponsor and great to work with! Secondly, we’re looking for Gold and Silver sponsors and any other donations to help make this event the best event it can be (and to ensure that we can keep running these events in future). Every little bit helps! If you’d like to help us out and get your name or brand in front of hundreds of local game developers (students, hobbyists, and professionals), please contact us for more information. That’s all for now. See you at Show Us Your Bits on Saturday 27 August! 4 of us will come along to have a look, thanks.